Dogs are amazing creatures. They provide unconditional love and all we have to do in return is love them equally and take care of them as best we can. It sounds like common sense, but unfortunately there are many dogs that get abused, abandoned, and suffer greatly. This dog found itself in a whole lot of trouble. Thankfully there exists rescue groups out there that save animals that find themselves in harms way. This dog was indeed rescued from totally horrific conditions. Animal Aid India volunteers looked down this hole and saw something shocking. A dog was down there. The volunteers found his face practically destroyed by maggots as he somehow ended up in this hole, either to pass away from his horrible condition, or perhaps someone put him in there to die. The volunteers came to the dogs rescue. The dogs name was Kulu. They lifted him out. They successfully got him out of the hole. Maggots were in Kulu’s face. Obviously, a sight like this makes even the most dedicated dog rescuer to consider a mercy killing. These rescuers considered just that, as he was so bad and clearly suffering. But they decided to try to give him a second chance once they started removing the maggots and believed more and more that it just might be possible. They cleaned Kulu’s face using a powder to kill the maggots. Next was dealing with Kulu’s other injuries. Volunteers could not find the dogs eyes and his face bones were exposed. But the dog still could eat. He started out eating slowly, but his consumption improved as did his recovery. Then the unthinkable happened. His left eye actually appeared! It was there the whole time it turns out. His facial improvement is absolutely stunning. It took three months, but Animal Aid India did it! They totally transformed this dog! The dog is now active, running around the facility. Everybody fell in love with Kulu. From a massive hole in the head to this remarkable recovery. Anything is possible. 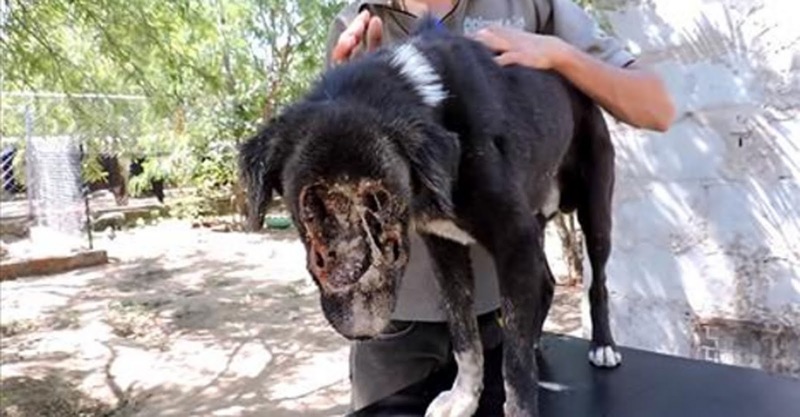 Check out this amazing video where this dog miraculously transforms from horrific to heroic. Share this amazing story of recovery with all your friends and family!